GOOD JOURNEY (USA) (Chestnut 1996-Stud 2003). 7 wins at 1m, 8½f, Woodbine Atto Mile, Gr.1. Sire of 466 rnrs, 311 wnrs, 15 SW, inc. Happy Trails (VRC Emirates S., Gr.1), Griante, Grand Journey, Sound Journey, Sensible Lover, Home Journey, Lord Aspen, Sino Brilhante, Crafty Cruiser, Jim's Journey, Lotion, Dancingtothestars, Thirtyfirststreet, Aotearoa, Bella Viaggia, SP Journey On, Kathleen Rose, Posh Journey, Go the Journey, Metro Cowboy, etc. BY THE GRACE (g. by God's Own). 5 wins from 1200m to 1600m, A$398,050, Balaklava Cup, L, VRC Secondbite Fresh Food Rescue H., KA Morrison H., SAJC Schweppes H., 2d VRC Brian Beattie H., Julie Aldridge & Cynthia Norton H., MRC Bigscreencompany.com.au H., SAJC Ubet H., 3d VRC Rod Johnson H., Swisse Wellness Trophy H., MRC CRV Hospital Helping Hand H., Charter KC & BSP Lawyers H.
Big Kahuna (g. by Quest for Fame). 2 wins at 1200m, 1400m, HKJC Po Shek Wu H., Grass Island H., 2d HKJC Johnston H., Hamilton H., Great George H., Forever Love H., 3d HKJC Moreton H., Miami H., Phoenix H., Lam Tin H., Audemars Piguet Edward Piguet H., Tong Fuk H.
Terpsichore (f. by God's Own). 4 wins at 1400m, 1450m, A$120,762, 2d VRC Beachside H., SAJC Sportingbet H., 3d VRC Le Pine Funerals H., MRC Le Pine Funerals H.
Dancing Journey (f. by Good Journey). 2 wins. See below. Testya Patience (g. by Testa Rossa). Winner at 1200m in Aust. Rain Dance Man (g. by Octagonal). Winner at 1600m in Aust. Pradnya. 7 wins to 1500m, A$118,385, to 2016-17, 3d ATC More Than Ready at Vinery H.
Sithali. 3 wins at 1100m, 1200m to 2016-17 in Aust. Elite Drake. 2 wins at 1400m in 2017-18 in Aust. RAIN DANCE LADY (Jugah). 7 wins. See above. Golden Papillon. 5 wins from 1200m to 1600m, A$84,065, MVRC La Notte Restaurant H.
Flutterby. 5 wins to 1450m, MRC Lobster Cave P.
Jugah's Lady. 2 wins-1 at 2-at 1200m, 2050m, VATC Sir Stanley Savige H., MVRC Super VOBIS 2YO H., 2d VRC Grosvenor H. Producer. Milliebrae. Winner at 1600m, 2d MRC Valley of Georgia H., MVRC University Meats H.
High Hopper. 4 wins to 1150m to 2017-18 in Aust. Radiant Warrior. 2 wins at 1000m, 1200m to 2018-19 in Aust. Raging Baa. 6 wins from 1200m to 1650m, A$79,245, TRC Royal Rambo H., Gallipoli H., TTC Eliza Park Stud H., 2d TRC Thetote.com.au H., TTC Members H., Dorma Door Controls H., Farewell Darrell McKenzie H., Cascade Pale Ale H., 3d TRC Gee Gee Horse Stud H.
Princess Rage. 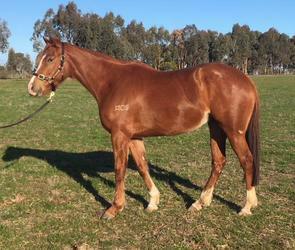 Winner at 1400m, 3d MRC Sportingbet P.H. Cip Cip Hooray. 4 wins from 1400m to 1750m in Aust. MAGIC BIRD (Ali-Royal). Winner at 2, VRC Anzac Day S., L, 2d MRC Prince Salieri H., 4th VRC Gibson Carmichael S., L.
Leeds United. 5 wins to 1500m, 3d BTC Carlton Draught H.
Hiss and Tell. Winner at 2400m in Aust. RAIN AT BAY (Vain). 2 wins-1 at 2-at 1100m, SAJC Cinderella S., L, Tom Jenner H., 2d SAJC Make Mine Roses H., 3d SAJC Taj Rossi H., Entrancing H.
More Luskin (Luskin Star). 4 wins from 1450m to 2000m, 2d BATC Marco Polo Hotel 2YO H., 3d VRC Maribyrnong P., Gr.2, VATC Merson Cooper S., Gr.3, QTC AWA 2YO S., MVRC Lombard Catering Supplies H.
2 wins at 2100m, 2200m in 2017-18, 3d SAJC Adelaide Galvanising P.